As a young child, Flordemayo was recognized as a seer. By the age of four, she had already begun her training as a curandera espiritu, a healer through divine spirit, a gift inherited through long family lineage, originating from the Maya highlands of Central America. 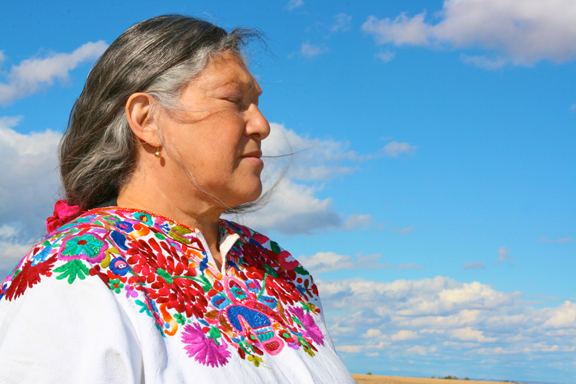 She is a member of the International Council of 13 Indigenous Grandmothers, standing for peace and healing of the Mother Earth. When messages come strongly, Flordemayo knows to answer them—no matter the obstacles. What is the timeliness of this vision? Apab’yan Tew is an Ajq’ij, a Day Keeper, and spiritual guide of the sacred K’iche Maya tradition from the village of Nawalja’ in Sololá of the Guatemalan highlands. His ceremonial work most often takes place in caves, engaging with resident energies of the natural site and timing of the Tzolkin calendar in conjunction with needs of communities or individuals. Like Flordemayo, his gifts evolved from childhood until he ultimately answered the call through a series of difficult shamanic challenges. In Indigenous traditions, every aspect of life is integrated and sacred. This Maya spiritual leader is quite clear that to surpass a cycle creates imbalance. Nothing should be moved from its place in the Universe. His people think of the seed as a living feminine entity, not a commodity. There is a proper way to carry her, to talk to her, the Sky and the field in the act of sowing according to specific timing. This in itself is a ceremony, integration of a flow that already exists and must not be taken from those like himself who hold these ways close. There are those who seek to eradicate the sacred ways. He believes there is no current problem with GMO seed infiltration in the high altitude area of his village: “You don’t sell milk to a cow!” For the Guatemalan highlands, there’s not enough room for the politics of Monsanto. What the West calls “organic” these Maya farmers have been doing for eons—and the best selection has long ago been made. However, he sees a danger as any of his people become more influenced, perhaps by emigrating and then returning home, to set aside their ancient ways of living. That same protection isn’t available to Native and heritage farmers in the US. Five years ago I sat in a conference session and heard a Zuni man sadly express the fear he held: the real possibility of GM seeds blowing into the fields that he and his ancestors had planted with their pure Native strain for hundreds of years. It was disheartening and outrageous. If the spirits of Earth and Sky are no different than the seeds they sow, the food they eat, what their bodies are made of…then to tamper with any part is an outright act against religious freedom and quality of life, rights the US constitution is supposed to uphold. For giant agribusinesses to also attempt to spread their seed where people have few rights equates to preying upon those who have a voice but are ignored. When spiritual tradition falls apart, grounding dissolves; detrimental influences make additional in-roads; suffering takes over—a process proven over history. Spiritual pride is lost; ethnic groups are additionally marginalized. A grassroots movement has sprung up. 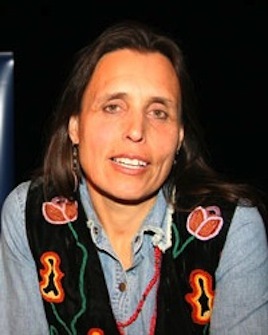 Winona LaDuke, an Anishinaabekwe (Ojibwe) enrolled member of the Mississippi Band Anishinaabeg, is known as an environmental activist. She is the Executive Director of Honor the Earth, where she works on a national level to advocate, raise public support and create funding for frontline Native environmental groups. She lives and works on the White Earth Reservation. Her organization offers a number of naturally derived products that may be found via Native Harvest online to help fund the White Earth Land Recovery Project. Local volunteers and those from some distances come regularly to continue building and advise. Greg Schoen is one of them. He’s impassioned about seed preservation: “Crops are being stripped and ‘dumbed down,’ the diversity bred out of them. 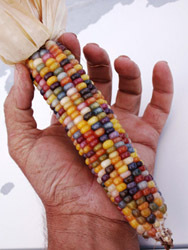 When we do this to the corn, we do this to ourselves.” He got his start as a seed saver in the mid-1980s receiving his original “Glass Gem” jewel-like kernels from Carl L. Barnes, a mixed blood man of Cherokee/Irish/Scots ancestry now in his eighties living near Liberal, Kansas. Over the years, Greg received other Native varieties from Carl, planted them himself and gifted them to such organizations as Native Seeds/SEARCH in Tucson, Arizona. Kenosis Spirit Keepers is the volunteer-run nonprofit I founded to help preserve Indigenous wisdom traditions. We see the Native seed issue as an integral aspect of Indigenous spiritual traditions and are helping to support the Seed Temple. More is still to be done in the way of construction and obtaining all things necessary to start up and maintain. One way Flordemayo plans to help fund the project is through classes in the growing and use of medicinal herbs, sacred bathing, and vision and dream work. She has turned the Hogan, located next to the seed vault, into the Temple of the Golden Child, which will be used for this purpose. More and more independent seed saving operations are being established in pockets around the globe. Greg Schoen continues to quietly do what he can to preserve our heritage by sharing his passion, experiences and seeds with others on a similar track. 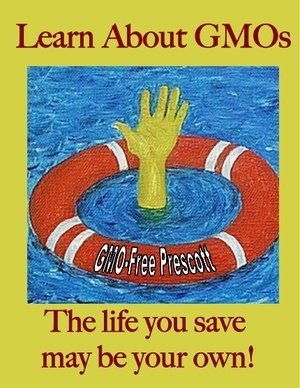 Shea Richland believes so strongly in our birthright for health and well-being that she reluctantly stepped into the public eye to form GMO-Free Prescott and educate regarding our choices. Winona LaDuke works at the national level through organized environmental activism. Flordemayo answered a vision. Apab’yan Tew performs ceremonies for the well-being of the planet in the dark recesses of caves. It takes all of us, each bringing our own way, in the face of such forces that would act against us, to support and maintain our collective birthright—and succeed. This article is being incorporated into the Anishinaabekwe (Ojibwe) Farming Curriculum that will be part of the Tribal Community Colleges in the region where Honor the Earth Foundation is active. Kenosis Spirit Keepers is sponsoring Grandmother Flordemayo and seed savers Greg Schoen and Dianna Henry for events on January 31-February 1, 2014 in Phoenix, Arizona. The proceeds from ticket sales go to support the seed saving project founded by Grandmother Flordemayo. For information and to purchase tickets, please go here. Interviews with Flordemayo, October 17, 2012 and February 1, 2013. Interviews with Greg Schoen, October 17, 2012 and February 8, 2013. Interview with Apab’yan Tew, November 6, 2012. Interview with Winona LaDuke, November 27, 2012. Interviews with Shea Richland, November 9, 2012 and January 2, 2013.